The Last Minute Market is THIS SATURDAY!! Don't miss this show. It.Is.Going.To.Be.Swell. Our Next Handmade Market- at Wooltex Dec 5th. For more information about the show and ways to help spread the word, visit the show website here. PLEASE NOTE-as of 11/20/09, applications are closed, but you may sign up for the waiting list here. We're giving Cleveland another chance to shop locally and buy handmade for the holidays! Do you Twitter? Cleveland Handmade does! Follow CleveHandmade on Twitter.com to see the latest from the Cleveland Team on Etsy. Team member zJayne recommends posting on Twitter using #clevehandmade so that other team members can find you and follow you too. 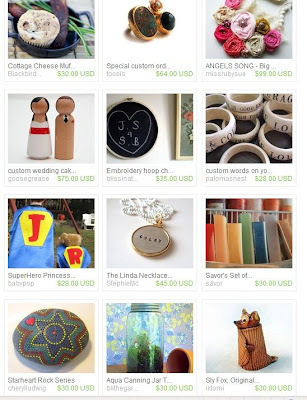 For example, tweet "I'm a proud member of #clevehandmade - Search ClevelandTeam on #Etsy to find us." The # sign or hashtag makes it a clickable link and a way to easily find similar Twitter posts. Using the @ symbol, followed by a username is a way to mention a specific username. So, if I Twitter "@zJayne Love your dryer pouches!" not only will zJayne be able to see that I sent that message, others will be able to check her out on Twitter as well. This may be confusing for those of you who are not familiar with Twitter. No worries! If you are new to Twitter, the first step would be to follow CleveHandmade. We don't currently have a list of Cleveland Handmade usernames on Twitter, so we'd like it if you could comment on this thread, leaving your Twitter username. That way we can follow each other and have a list of teammates on Twitter. 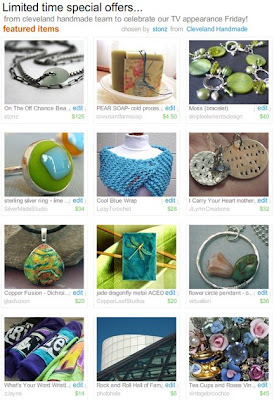 Whenever possible, it's good to "tweet" or post a clickable link directly to www.ClevelandHandmade.com, or do a "ClevelandTeam" search on Etsy and post a link directly to that search. 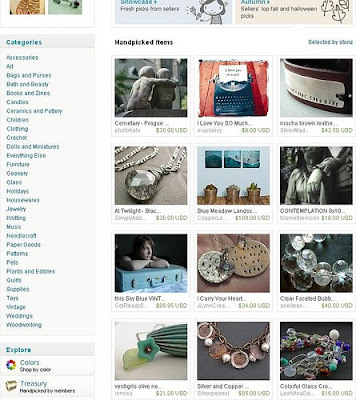 People are more likely to click on the link than they are to actually go to Etsy and search "ClevelandTeam" or to type out www.ClevelandHandmade.com in their browser. Twitter is all about the clicks. This is especially important to help promote the giveaways on the website. 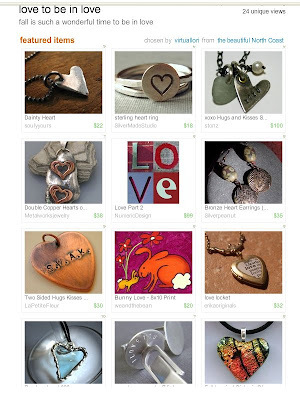 @Etsy is currently looking for items for their Etsy Twitter Gift Guide. If you'd like to participate you can put #myetsy with a link to your item. I'm not sure if this is a limited-time opportunity, or if they will continue to update the Gift Guide. 1) The team tag to use on your items and when searching for members' items on Etsy is "ClevelandTeam" (without the quotation marks). 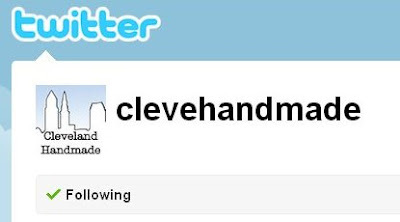 2) The Cleveland Handmade Twitter account username is "CleveHandmade" (not Cleveland, just CleveHandmade without the quotation marks). 3) Follow us on Twitter @CleveHandmade, follow @Etsy, follow teammates as we post our usernames in the comments on this post. 4) Support your teammates by Tweeting about their successes, special promotions, etc. Using the @username and the #clevehandmade will get people looking and clicking. 5) Please feel free to ask for help in the team forum, or to convo me, LazyT or zJayne if you have any questions. 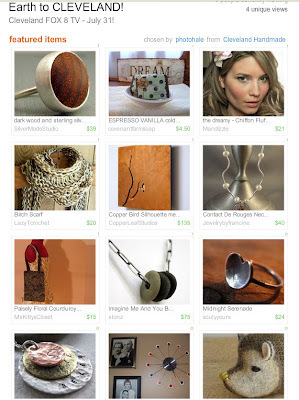 Thanks to virtuallori for this list from Cleveland Handmade! Happy Halloween, from zJayne and the Cleveland Team! 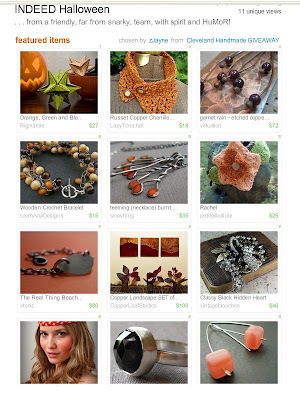 Thanks to JenniferLynnStudio for a great Cleveland Team Treasury! The evening will be highlighted by an auction of hand painted wine, martini, and champagne glasses designed by local artists. Local artists are invited to create/paint/decorate glasses, which will be auctioned at the Sip into the Holidays charity event. The auction, featuring one-of-a-kind glasses created locally, is an opportunity for painters, decorators, and other creative people to use wine, champagne or any other glass as their palette. Glasses can be painted/decorated in any style, from traditional to outrageous, colorful, sculptural, decorative, whimsical or avant-garde. We ask that you design at least two(set) for the auction. The individual artists will provide glasses, all paint, and any other materials.. There is no entry fee and glasses must be completed and dropped off to Local Girl Gallery by Saturday, November 15, 2009. A brief description of each glass set, its title, and an artist/designer bio will be printed for guests at the auction. The event is limited to the first forty-five artists who register. Questions can be forwarded to Ruth Koenigsmark(216)521-2894 or rkoenigsmark@yahoo.com. Artists can send their bio and glass descriptions to this email address as well. 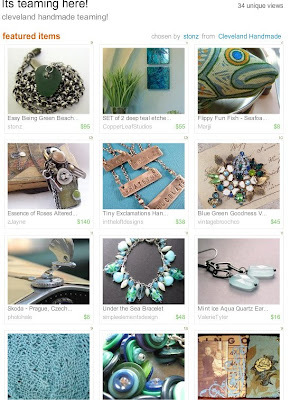 Thanks SToNZ for creating such a fabulous treasury! 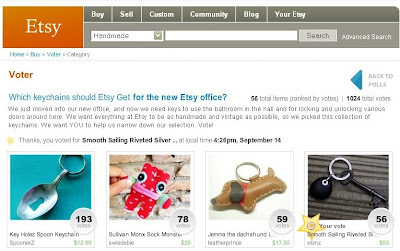 The Smooth Sailing Riveted Silver Beach Stone Key Ring from SToNZ has been included in "Which Keychains should Etsy get for their New Office?" Voter Poll. Please take a moment and show your support! (Voting ends Sept. 20th.) Vote HERE! 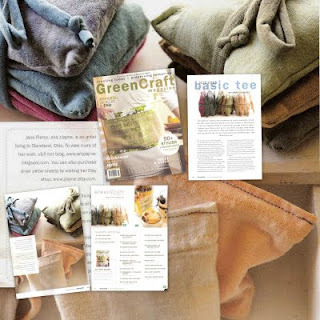 zJayne Featured in "Green Craft Magazine"
Congratulations to Jane Pierce, AKA zJayne, for her fabulous feature in the premiere issue of "Green Craft Magazine"! We're all big fans of her work and her accomplishments in the eco-friendly world of "Waste Not Want Not"! Be sure to visit Jane's blog and read all about it! Connie Hozvicka, Christine Claire Reed, and Andrea LeBlond at Terra Vista Studios in Cleveland, Ohio. "Painting and the Art Journal" with Connie Hozvicka - "Together we will dig deep through the layers of self to release the symbols and images we keep buried within and use them as our muse for an Art Journaling journey filled with fun, reflection, and painting euphoria." "Writing Your Shiniest Story" with Christine Claire Reed - "...a journey through the creative self via writing and a bit of beginner yoga, exploring how and where we are creatively stuck." "Pinch Pot Portraits" with Andrea LeBlond - "Following the ancient multi-cultural tradition of mask making..."
Visit Creative Dig for detailed workshop descriptions and all the info. you need! Fee: $125.00 includes all three workshops and catered lunch by Dish . Thanks SToNZ for creating a fun team treasury! 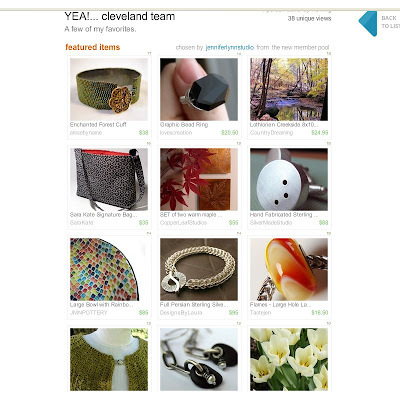 Search ClevelandTeam on Etsy to browse items from our team members. Art House is throwing a house party, and you're invited! 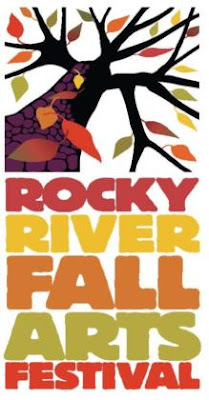 Local community organizations and businesses will also be participating. Please come out, show your community pride, and make art! Art House - Where Art Lives! Earth to Cleveland! Watch for Cleveland Handmade on Fox 8 News in the Morning, July 31st! 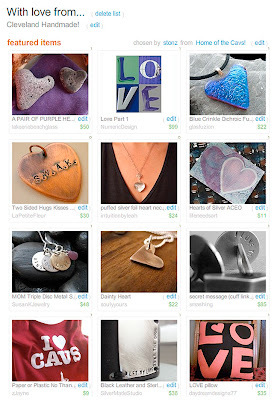 Thanks to photohale for creating this fun Cleveland Handmade list! It's time for another Cleveland Team Challenge! We've had some fun challenges in the past. Let's get some ideas together here and then we can decide which we'd like to do first. So, please reply to this post with your idea(s) for challenges. Anything and everything will be considered, so don't be shy. Even if it's something seasonal that we can plan on for future challenges, we'd like to hear it now! Members of Cleveland Handmade, the Cleveland Etsy Street Team, are invited to join us for a garden party at Cindy's Farm in Aurora on Sunday, July 26, 1–5 p.m.
More details and a signup form are here. now is the time to apply for the salty not sweet indie craft show, slated for September 5th in Cuyahoga Falls at the Quirk Cultural Center from 12-8pm. this show is being produced by Candra Squire, a fellow Etsian and Oddmall vendor whose cards are so unbelievably funny that i nearly expired from laughing way too hard. With love from Cleveland Handmade! 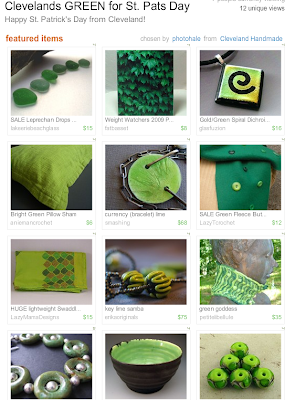 Etsy treasury with items from the Cleveland Handmade team! In honor of Father's Day, our next challenge will be "For the Guys." Deadline for submitting your item is noon, May 31. Voting will take place June 1–8, and the winner will be announced June 9. Giveaways on Cleveland Handmade are a great way for us to attract new visitors and get the word out about our team and individual members. We intend for this to be a monthly feature, although if there is enough interest we may increase the frequency. Entrants will be asked to choose their favorite item from the giveaway shop as well as their favorite item from another CH shop so that this is a promotion for more than just the person sponsoring the giveaway. 1. One CH-hosted giveaway per member per year. 2. Your item must be valued at $15 or higher. Those who make less expensive items can put together multiple items as a group to reach the minimum. 3. Your item and shop must be in the spirit of "handmade" and represent Cleveland Handmade well. Mass-produced items that are only minimally altered will not be considered, even if they qualify as "handmade" by Etsy standards. Team leadership reserves the right to decline any giveaway item offered or participation from a given shop for any reason. 4. Your giveaway item does NOT have to be something you have listed in your shop, although it should reflect the quality and style of what is in your shop. For example, if your thing is modern sterling silver jewelry, your giveaway should not be a paper bookmark. 5. Your giveaway should be an actual item, not a gift certificate or free shipping or anything like that. 6. You must have good photos and at least a dozen items listed in your shop to participate. We're putting our best foot forward here and asking people to take a look around, so you should represent the team well. 7. You are responsible for shipping the giveaway item to the winner at your expense. Entries will be open to people in the United States only, because international contest law gets complicated. If your item gets lost in the mail, it is your responsibility to replace and reship the item. We want happy customers. 9. Team members are not eligible to win prizes. 10. Giveaway entries will be open for one week. Winners will be chosen via the Random Number Generator. CH will contact the winner and pass along their shipping info to the giveaway sponsor. 11. We reserve the right to adjust or modify these rules at any time. By popular acclaim (that is, seventy billion exact same suggestions), the next challenge is May Flowers. Submissions will be accepted until noon, May 4. Voting will be May 5-11, and the winner will be announced May 12. The Waterloo Arts Fest in the Collinwood neighborhood of Cleveland will be held June 27, 2009. They are seeking vendors. You can download more information and an application here. we are going to print postcards with photos of (up to) 15 different items made by Cleveys! each photo (if we get 15 shops to participate) will be about an inch square and our ClevelandHandmade logo will also be featured. the back of the post cards will give the name/URL of each shop featured on the front along with a blurb about our team and how and where to find us. depending on the number of participants (and when my coupon code expires), we could ideally get 3000 postcards for just under $10 a person. please contact Kathy at smashing AT cox DOT net or convo "smashing" on etsy if you are interested or have any questions. Special thanks to photohale for creating this green list! What can individuals do to help the team as a whole? It could be a crazy, wacked out idea. Doesn't matter. Right now we're just brainstorming. Think about things that will raise our visibility as a group in the local community, spread the word about individual team members' work to people who haven't seen it before, get people out to the shows that we do (sponsored by us or sponsored by others), educate the public and/or your teammates, support your teammates, and ultimately drive more sales. Eventually, we're going to put these together in a big list of possibilities and ask that each member consider doing one or more of them. We will discuss these ideas and more at the playdate! Adding your items to Google Base can be confusing. You don't have to understand how it works, or how the RSS feed works to do this. Here are some links to tutorials and information to help you figure out how to set it up. Once it is set up, you don't have to do it again. You can set it to automatically update on its own. If you have any trouble getting it to work, you are welcome to contact me, LazyTcrochet, or contact support@Etsy.com. They were very helpful when I had issues with it. Be sure to read the comments under the post as well. Now that Etsy's RSS feed works with Google Base, it's much easier to schedule the data feed to update automatically. I have mine set to update once a week. If you are loading many new items every day, you may want to set yours to update every day. If your items aren't changing that much throughout the week, then once a week should be fine. I think Google may have an issue about updating your feed too often if it's not necessary. Don't be intimidated by all this. Sign up for a Google account, if you haven't already, and go to Google Base. 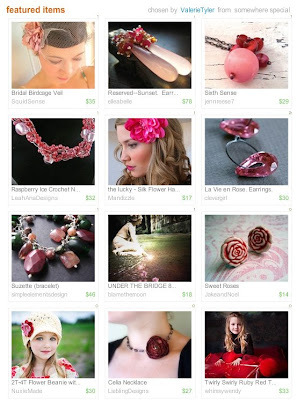 Open a new tab or page to have access to your shop's main page. And open another tab or page with the tutorial instructions. Then you can go back and forth while you are working on it. Once you have it set up, it may take Google awhile to process the information. You can check back and make sure that it says that it was successful and that your items are "published and searchable." There may be certain keywords in your listings that they may find objectionable and a scheduled upload may "fail" even though it has gone through successfully many times before. Just check in once in awhile to make sure that all is well. 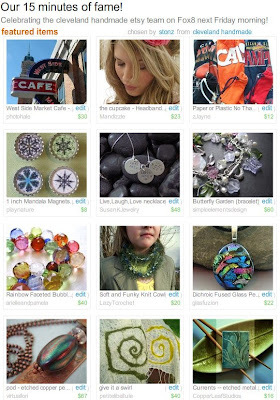 Submit a listing for the spring challenge, "Welcome, Spring!" 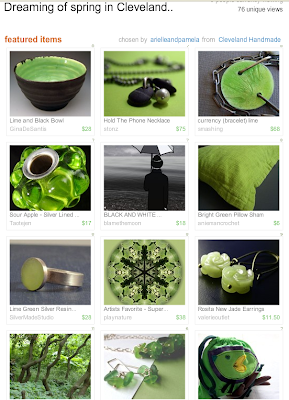 Items do not have to be all about flowers or bunnies or what have you, but should reflect what spring means to you. Deadline is noon March 16. Thanks arielleandpamela for creating such a beautiful taste of Spring! Visit ClevelandHandmade.com for more. 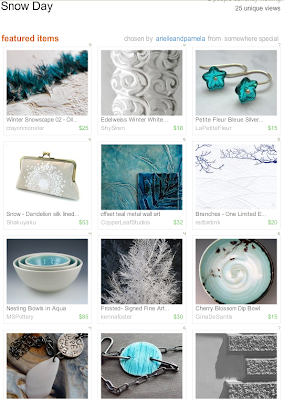 Thanks to arielleandpamela for creating a beautiful snowy treasury. CALL FOR ARTISTS! Oddmall show! Hudson, Ohio will be the site of the first annual Oddmall Emporium of the Weird on Saturday, May 9th, 2009. Oddmall needs you! Reserve your booth by February 8th and save 20%! To apply for the show: "email a sample or three of your work (72 dpi jpegs, please) or a link to your website to Andy at mailto:andy@andyhopp.com?subject=Oddmall." "We are looking for various performers to entertain the masses at Oddmall. If you are a musician, magician, juggler, dancer, balloon animal maker, or any other unusual performer and you'd like to strut your stuff at Oddmall please contact Andy at andy@andyhopp.com." There isn't much time! Donations need to be received by Jan 29 so if you want in, you better act fast! There is also an opportunity to include a Cleveland Handmade advertisement in the event's program. $50 for a half page ad anyone interested in chipping in a few bucks or designing it?? ?